The statutory rules of PFICs are set forth in 26 U.S. Code § 1297 – Passive foreign investment company. The U.S. Treasury and IRS also published new regulations in January 2014 on PFICs. For an overview, see “PFICs” – What is a PFIC – and their Complications for USCs and LPRs Living Outside the U.S.
United States Citizens living overseas, whether or not they are “Accidental Americans”, as well as lawful permanent residents (LPRs) living outside the U.S. generally have the burden of proof under U.S. tax law to show they complied with U.S. law. Indeed, when the Internal Revenue Service (IRS – the U.S. revenue authority) makes a tax assessment against an individual, the law generally carries with it a “presumption of correctness” in favor of the IRS. This presumption of correctness was confirmed by the U.S. Supreme Court and therefore imposes the burden on the taxpayer of proving that the assessment made by the IRS is erroneous. During my career, I have seen plenty of erroneous assessments made by the IRS, and an increasing number of assessments made against taxpayers residing in countries throughout the world, be it France, Australia, Canada, Russia, Germany, Mexico, Thailand, Japan, Hong Kong, etc. Why is this presumption of correctness relevant, when PFICs are explained and discussed here? The law of PFICs is complex, to the point that very few IRS revenue agents really have any detailed understanding of how PFICs work, when they apply and how taxpayers are to report their investments in PFICs. Very few U.S. tax practitioners understand PFICs. Accordingly, I regularly see errors made by the IRS in proposed tax assessments, including PFIC calculations. Unfortunately for the individual taxpayer, they must prove the IRS is wrong in its tax assessment. PFICs create a real burden on individual taxpayers who have shares in a PFIC in different locations around the world, since it is rare that foreign companies, investment funds, mutual funds and the like ever provide any detailed accounting of (a) asset, or (b) income information (per U.S. tax rules) that are required to be reported by PFIC investors who are USCs or LPRs. Unlike a controlled foreign corporation (CFC), a PFIC has no ownership threshold. If a USC owns just 1,000 shares/units out of 20M issued shares in a foreign mutual fund, the U.S. citizen will nevertheless need to report this 1,000 share/unit interest (even though this is only 0.0005% of the fund) on his or her individual income tax return if the foreign mutual fund meets – the income test or asset test. Virtually all mutual and investments funds will satisfy these tests, since by definition the funds are making investments in other companies or other passive income items, such as bonds, stocks, futures, ETFs, etc. The income test is met when at least 75% of the income is passive income as defined under the law. The asset test is satisfied when at least 50% of the foreign corporation’s average assets produce such passive income. many other complex calculations that require basic information to be provided by the PFIC in the first place. What foreign fund or investment company around the world (located in whatever country – catering to customers commonly in their own country) even tracks or accounts for income and gains for U.S. tax law purposes; i.e. “ordinary” earnings versus “capital gains” – specifically including the netting of “capital gains” and “capital losses” as required by U.S. law? I certainly do not see such accounting records provided in the marketplace of investment funds, hedge funds and companies that cater to persons residing outside the U.S. Most foreign companies around the world (unless they are controlled and managed by USCs who are aware of these U.S. tax obligations) never maintain such accounting records or the detailed information necessary to even provide it to their USC or LPR investors. Hence, USCs/LPR investors may never be able to accurate make these PFIC calculations. Also, the ownership of shares/units of the fund might always be changing throughout the year. In other words, even if the “ordinary income” and “net capital gain” is available for a particular fund/PFIC, the total number of outstanding shares/units has to be stable or known for the USC or LPR to calculate their pro-rata share. In the above example, if there are 20M outstanding shares/units at the beginning of the year, but by the end of the year there are 22M outstanding shares/units, how is the USC or LPR investor ever going to be able to calculate their pro-rata share, assuming they have the “ordinary” earnings and “capital gains” amounts for the entire calendar year? Its not simply the “ordinary” earnings and “capital gains” multiplied by 0.0005%. 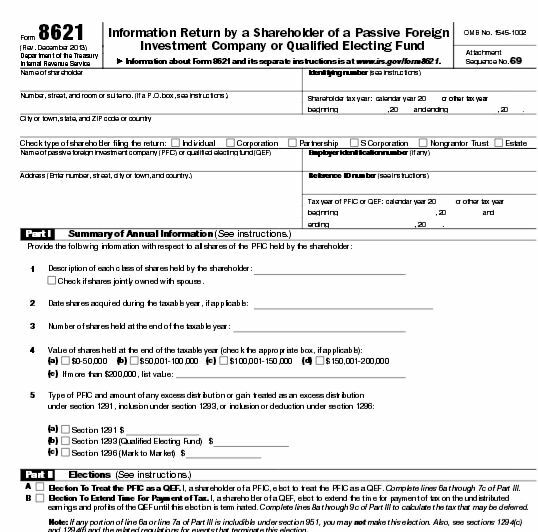 The only “good news” in this explanation of PFICs, is that there is not an automatic US$10,000 penalty for failure to file their investments in a PFIC on IRS Form 8621, Information Return by a Shareholder of a Passive Foreign Investment Company or Qualified Electing Fund. This is a departure from the normal rule of a minimum US$10,000 penalty for failure to file information returns regarding international (i.e., non-U.S. assets and investments). See, USCs and LPRs Living Outside the U.S. – Key Tax and BSA Forms. All of these tax compliance rules begs a very important question for a USC who is considering renouncing their U.S. citizenship. The issue arises if they have had investments in PFICs during the last five years. If the USC has not been complying with IRC Section 1297 regarding PFICs, how can the taxpayer ever certify under penalty of perjury ” . . . that he has met the requirements of this title for the 5 preceding taxable years. . . [for purposes of Section 877(a)(2)(C)]”? More details about PFICs to come in later posts. Your post demonstrates beyond a shadow of a doubt whiy long term U.S. citizens must renounce U.S. citizenship. Leaving aside the S. 877 certification test, the idea of applying these rules to non-U.S. mutual mutual funds bought by Americans residing in the country where the fund is incorporated is not just stupid – it’s actually sick. Then we add to this the fact, that foreign mutual funds were not even considered to be PFICS until recently, coupled with the willingness to compute the interest charge on years before they were even understood to be PFICS is an embarrassment to U.S. law, an embarrassment to the IRS and an embarrassment to the lawyers and accountants who play a role in the “PFIC Confiscation of Assets”. To your point of “can mutual fund owners ever certify 5 years of tax compliance”? Probably not. But, the U.S. tax code so complex that nobody could ever certify the 5 years anyway. Main point is to NOT be a U.S. citizen. @Renouncitizenship, if it is indeed technically impossible to certify five years tax compliance, then this means that it’s essentially impossible to ever cleanly expatriate from the IRS. With FATCA, the IRS will be able to pursue any and, in fact, ALL former citizens. We may never actually be able to enjoy full certainty that we’ve been able to escape morder…. I could thus see more attempts to get the Ex-Patriot Act passed or at least to have the Reed Act widely enforced.